The Manatee are large, gray-brown mammals that live in the water. They have rounded bodies that end in a flat tail that looks like a paddle and helps to move them through the water. Manatees also have 2 front flippers that they use to crawl along the bottoms of rivers. The head is large and wrinkled with a whiskered nose. Manatees have small eyes and no real ears outside their bodies, but they are still very alert and can navigate well. An adult manatee weighs between 1,500 and 1,800 pounds and can be up to 12 feet long. 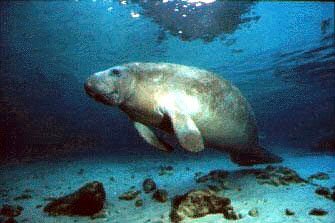 Most manatees are found in slow moving, warm, shallow waters near coastlines. They have been seen near Florida and the southeastern USA. Some have been spotted as far south as Central America. Manatees are very quiet, peaceful animals. They do not spend time defining territory or competing with others; instead they travel, play, and eat throughout the day. Instead of sleeping all at once, manatees take short 'naps' when they can. Manatees are plant-eaters, grazing for food along the bottoms of rivers and on coastlines. They often eat freshwater grasses or loose leaves that have drifted into the water--sometimes as much as 150 pounds of plants a day! Mantatees are very social animals, enjoying company in the water and rolling over and over to entertain each other. At about 5 years old, manatees may begin to mate. The female manatee is usually followed by a group of males. At mating time, she will breed with them and then separate. A female carries her unborn calf for 1 year and then gives birth. The calf is completely dependant on its mother for the first 2 years of life--the mother will provide milk and protect the young from enemies or the many human boats that might harm it. Usually a female will give birth to a single calf and wait at least 3 years between births. The manatee is an endangered species, mainly due to human capture and attack.